What is Civilization: Beyond Earth – Rising Tide? Why does it have so much punctuation in the title? Does it offer new gameplay possibilities and challenges for players? Let's ask this new trailer. What's that? "Rising Tide offers news gameplay possibilities and challenges for players." I guess that answers that then. 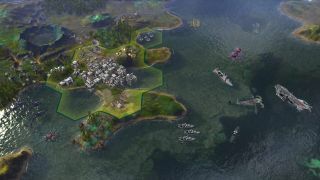 As for what it is, it's a water-focused expansion that brings rejigged diplomacy options, new factions and all the other new and tweaked stuff that you'd expect from a modern Civ expansion. Oh, and the punctuation thing? That's just because it's a PC expansion. They do that sometimes. It's due out in the Autumn.